During IM Spring Break last April, Christopher Hart spoke during the Internet Marketing Business session with Pamela Lund and Tony Adam. Pam talked about managing client expectations. Tony focused in on SEO evangelism. And Chris framed the conversation of online business as an evolution in response to a changing environment. Understanding where we’ve come from and where we are now can help companies position themselves for the environments of the future. The evolution that has occurred in the business world since the advent of the Internet is not unlike the evolution that has occurred in the natural world. Chris was reminded of this while watching Planet Earth one evening, and, in a stroke of creative genius, drew some vivid parallels to illustrate the state of our evolved business environment today. He presented those lessons at IM Spring Break and was kind enough to share his presentation with me. Since these are stories we can all learn from, I thought I’d share them here on the blog. Did you know that Blue Whales measure up to 108 feet long and weigh up to 172 metric tons? The Blue Whale is the largest living animal and may be the largest animal to have ever lived. However, these giants feed almost exclusively on krill, tiny shrimp-like animals. For the massive mammals to survive on a diet of these tiny treats, they have to consume 40 million krill, or 8,000 pounds, each day. It’s hard to believe that all those miniscule sea-bugs can sustain a marine titan like the Blue Whale. But it happens, every single day. Companies are like huge Blue Whales thriving on a steady stream of bite-sized nutrients. They require a constant input of small accomplishments in order to achieve large-scale success. At an organization, a number of employees within many departments each play a part in an online business initiative. For instance, the task completed by the copywriter is passed on to the SEO who meets with the marketing manager to get approval for a new landing page on the site. The new page will be implemented by a member of the programming department in partnership with someone on the Web design team. A thousand tiny decisions from a hundred different people might be made on the journey from idea to reality. Evangelism at the highest levels is required before the culture of understanding required for communication and cooperation is cultivated. With everyone onboard, it’s more likely that the many decisions made across the company will support the best interests of the organization’s online success. 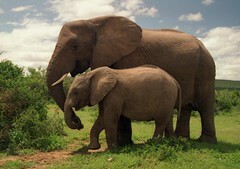 Elephants, the largest land animals, live for 50 to 70 years in a highly structured social order. Herds are made up of 5 to 15 adults plus several young. These tight-knit family groups are lead by the matriarch, and female elephants are the core members of the herd with male elephants leaving the group upon puberty. When a herd gets too large, a female may break off to form her own small group. If resources are scarce or if migration is necessary, hundreds of herds may come together to form a clan that aids in sharing or safety. Considering the complex family systems that unite and divide on a constant basis, it’s no surprise that elephants rely on advanced communication to keep track of the process. Imagine the chaos that would ensue if these mammoth animals, which can weigh up to 13 tons each, didn’t have tools of communication at their disposal. But because they do, elephants have evolved into large, intelligent animals with sophisticated social relationships that bring them to superior levels of efficiency. Like elephants communicating among the herd, a business must develop its internal communications so that the whole can function most effectively. The ability to easily and clearly communicate in terms that everyone understands is crucial to the success of each initiative and to the company’s survival as a whole. The potential for chaos within a company is just as real as it is within a clan of elephants. A refined online business initiative will incorporate SEO, PPC, SMM and ORM, among other things. And yet we know that no one part can be eliminated without an exponentially negative effect on the whole. With so many vital working pieces coming together, it’s necessary to have clear and continual communication at every stage of a project, from every level of the organization. Only then can the full potential of an online business initiative be realized. Most of a cicada’s life is spent underground as a nymph. However, before the end of their life cicadas come to the surface to mate. With vast numbers emerging from the soil at the same time, cicadas avoid population devastation. North American cicadas have a life cycle of either 13 or 17 years. It’s believed that these long cycles occurring at prime number intervals are a mechanism to help the insects avoid predators. For instance, predators with shorter life cycles, such as two to five years, can not rely on cicadas as prey. There’s a thing or two we can learn from our creepy-crawly cohabitators. Cicadas have evolved in ways that make sustainability of the species most likely. These insects, which are usually just one to two inches long, are vulnerable to any number of predators looking to engulf a juicy snack. 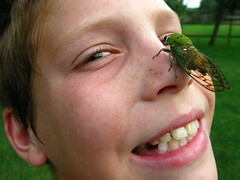 And yet the 2,500 species of cicadas around the world continue to flourish thanks to clever evolutionary adaptations. In its own way, a company must adapt to today’s marketplace in order to survive. Fast reaction times, creative problem solving and flexibility are required to stay on top in the online marketplace. Remember how the cicada spends much of its life below the visible surface? The majority of what an organization does will never be seen by the public eye. But, those “invisible” tasks that are accomplished every day are crucial to the success of the company. And while it would be nice for ROI, profitability and efficiency to always come measured in constant, reliable formulas, it’s usually not the case. Your marketplace, your competition, the search engines and the company itself are always moving, changing and growing. There are no cookie-cutter solutions to the challenges of doing business online; each obstacle requires a fresh strategy and understanding in order to craft a solution that works. In the natural world, animals have adapted to environmental hardships for millions of years. But in the business world, the challenge of a new online environment has forced unexpected adaptations. Time-tested evolutionary methods employed in the animal kingdom can serve as a lesson to companies struggling to gain footing online. Remember that attaining buy in from the top down will facilitate cooperation and understanding. Of course, maintaining communication across the organization is crucial. And forget out-of-the-box solutions; custom adaptations are much better suited to the fast-changing online environment. Obviously, Mother Nature knows what she’s doing, so don’t be afraid to apply nature’s knowledge to your online business evolution. good ‘natural’ concept… thanks Virginia! I also plan to put up an Online Business because the internet is also a good place to sell products. The number of Internet users and potential buyers from the internet is also growing.